When I booked to go to Lindos in Greece last summer (see my posts here and here) someone said something along the lines of "you don't go to Greece for the food...". Don't you?! I do! I absolutely love Greek food; souvlaki, tzatziki, gyros, feta, moussaka, kleftik, saganaki. God I'm drooling at the thought! So when we get a warm evening in the UK two things come to mind. Barbecue, or Greek food. 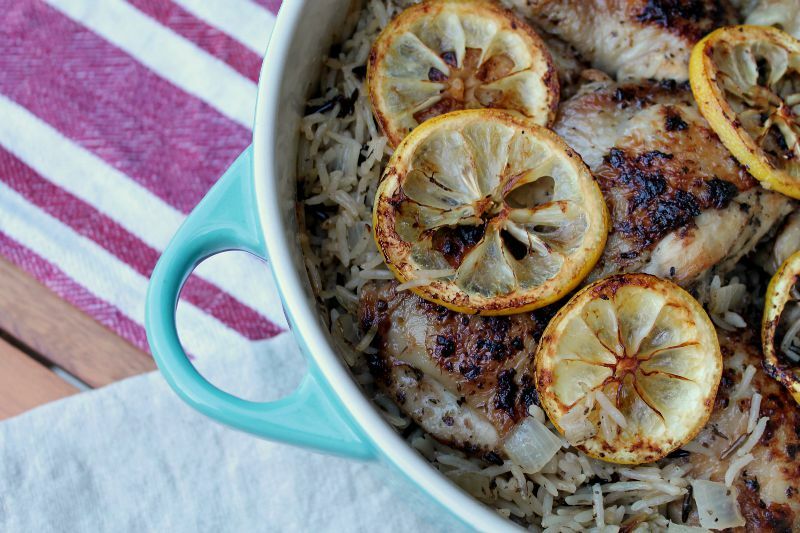 Ideally, both, but when I want a quick, fresh and tasty meal this lemon chicken rice is up there with the best. I adapted the recipe from this original, converting some of American measurements to UK and making some adjustments. This serves 2-4 people depending on appetite and how many chicken thighs used. Start by marinating the chicken. In a bowl cover the chicken thighs with the juice and zest of one lemon, crushed garlic cloves, 1 tbsp oregano and salt and pepper. Leave in the fridge for a couple of hours or so (the longer the better) so the chicken can absorb the flavours. Heat a non-stick pan and either throw in some olive oil or Fry Light, before placing in the chicken skin-side down. Put the leftover marinade to one side. Cook until golden brown before turning to do the same on the other side. Set aside. You may now want to rinse out the pan or use a different pan as there will be lots of fat from cooking the chicken. Use a hob-proof oven casserole dish if you have one. Fry the onion until golden before adding the rice, leftover marinade, chicken stock, oregano and seasoning. Bring to the boil, before transferring to an oven-proof casserole dish, placing the chicken on top and covering with a lid. Cook in the oven for about 30 minutes on 180c. Then remove the lid and cook for a final 5-10 minutes or until the rice is tender. Leave to rest for 5 minutes before serving. 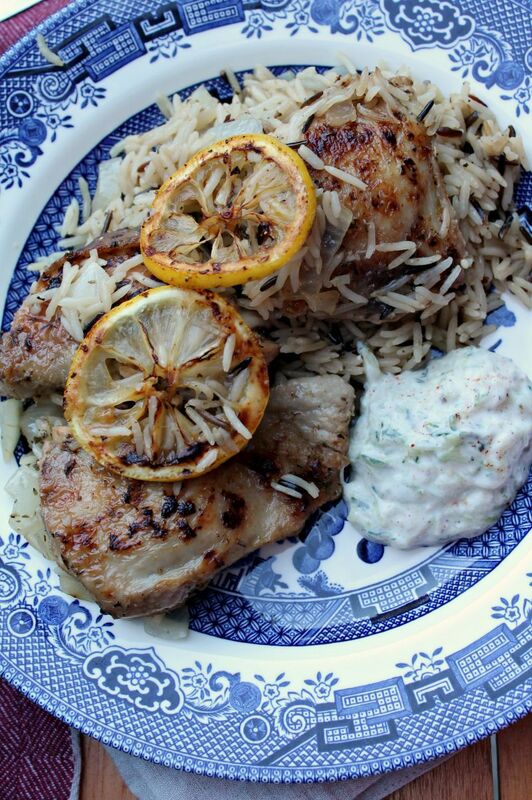 Serve with tzatziki (I use this recipe) and a Greek salad. Enjoy in the sunshine! 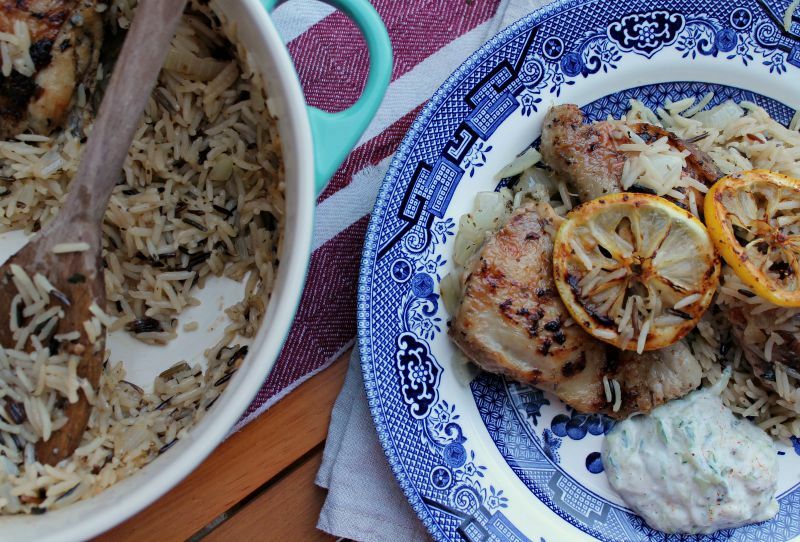 Chicken thighs with skin are quite high in syns; about 6 syns per thigh. 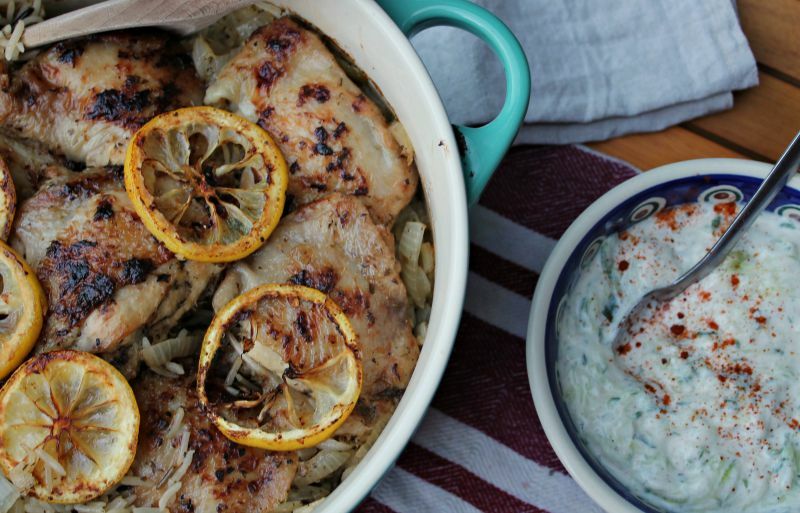 Make this lighter by using skinless filleted chicken thighs (like these) which are free.